I have been formulating in my head for a few weeks what I would write for this month’s blog. It was going to be brilliant, I promise. But then, last week I saw this photograph. I think anyone that sees this picture has to stop dead in his or her tracks. The amount of destruction and the masses of humanity emerging from the rubble seeking basic supplies because they lacked clean water, medicine, and food looks like an apocalyptic nightmare. But, this is real. How could one not be moved to tears? Not only did I weep but also I felt nauseous. I have thought of this picture every day for the past week and scratched my original blog post because of it. Obviously, it has stayed with me. Here it is. The faces in this picture are Palestinian. These are Palestinians in a country not their own. The injustice of their plight and how they are forced to live life everyday in the year 2014 disturb me. More than that, it haunts me. Maybe, because I love the Palestinians, maybe because I’ve worked with Palestinians, know Palestinians, and received hospitality from Palestinians. Maybe because I know them as human beings, this isn’t just a picture to me. I can feel the desperation, the loss of dignity, and the despair. This is a picture of real people caught in several political conflicts (Syrian regime vs. Rebels, Israeli vs. Palestinian), suffering and dying because they had the unfortunate bad luck of being born a Palestinian refugee. 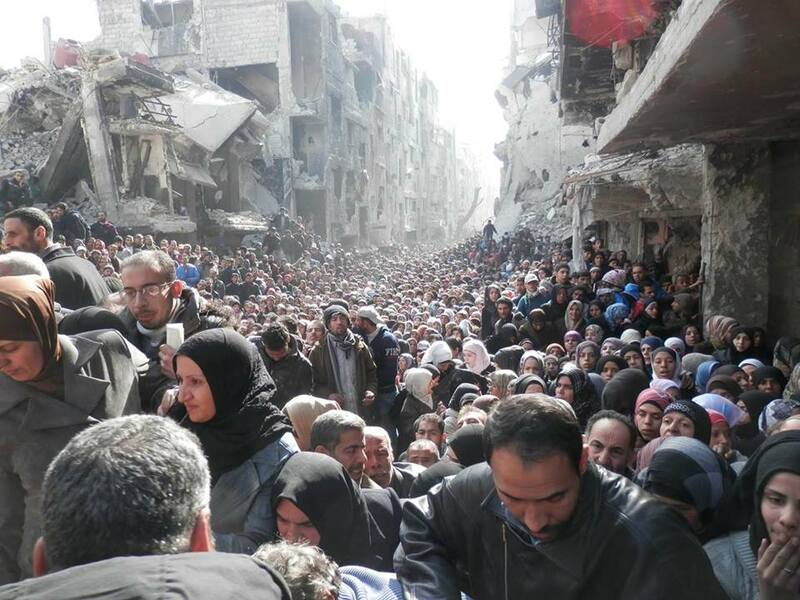 Yarmouk Palestinian Refugee camp lies within the city of Damascus, the camp has been under siege for nearly a year. For the past eight months it has been encircled by the Syrian army and cut off from any outside help. I wrote in my January blog that 15 Palestinians in Yarmouk had died of starvation. Now 50 people have died of starvation since October. The camp, which once had over 150,000 people in population, now has 18,000 trapped in ruins. In a country that is not theirs and caught in a war that is not theirs. But, they suffer, die, and somehow the world seems unmoved by it. “Yarmouk was established in 1957. It occupies an area of 2.1 square kilometres to accommodate refugees who were scattering in mosques, schools and other public places. Palestinians in Yarmouk went from pretty good, possibly as good as it can get for a Palestinian living in a permanent refugee camp…to this. For a week, the question I keep asking myself is, how? How does one retain one’s dignity in a situation like this? Already a refugee, already without rights, already at a disadvantage, already forgotten. Now, forced to eat pet food and water with salt and leaves. How does one not turn into an animal? How can their dignity be restored? This post took me way too long to write. I had to get up from my desk several times and walk away. When that didn’t work, I let go for a few days to calm down. My emotion and tears blinded any sort of logic or coherence in which to write this. It would be much easier to look at that picture, shrug my shoulders, and to forget it. Really, there is nothing I can do, I’m no one, what could I possibly do? Nothing, so I have no responsibility in it. And yet, that is not what I’m called to do as a believer, to be indifferent to others’ suffering. Here’s my question to my faith community, why don’t we struggle with the Palestinian plight? Why don’t we struggle with what justice looks like in the Middle East? Why don’t we struggle with extending forgiveness, grace, and reconciliation to all parties, regardless of who they are or what they have done? Why don’t we work for peace? Why do we pick a side, polarize them, and keep them divided? Why do we justify their hatred of each other, on both sides? Why don’t we struggle more with the cost of our freedom and what our responsibility is to those oppressed? This is a complicated situation, the plight of the Palestinians. I hope you struggle with it and I hope I can be that little pebble in your shoe irritating you with stories, stats, and pictures. I want you to know that I am nobody. Really, I am nobody special, not particularly gifted, I am not powerful, influential, or wealthy. That isn’t a good enough excuse for me to remain silent and do nothing. The following quote is attributed to both Edward Everett Hale and Helen Keller, maybe one borrowed from the other. It doesn’t matter who said it because it convicts me every time I read it. May you struggle with this picture and the very real suffering of the Palestinian people.